In my last blog on Ukraine, I discussed the Bronze age as defined by archaeologists and focused on the Early Bronze Age as it pertained to the Ukraine. Today I focus on the Middle and Late Bronze Ages. You can read my previous blog here. The origins of the Catacomb cultures go back to 2800 – 2700 BC. The earliest Catacomb culture graves are located in the steppes north of the northern Caucasus and in the Don valley. Over a period of two to three centuries, the Catacomb culture spread west throughout the entire Pontic region, as far as the mouth of the Danube River. The Catacomb culture is known for its sophisticated bronze weapons, tools and ornaments. There are great similarities in material culture between the area in the northern Caucasus and the steppes. These include bronze pins and medallions. Wagon burials continued in the Catacomb region for exceptional people. In the Ingul valley, west of the Dnieper, as well as in the steppes north of the Caucasus, some Catacomb graves contained skeletons with clay death masks applied to the skull. The Catacomb economy emphasized pastoralism. One grave near Tsa-Tsa, south of the Volga, contained no less than forty horse skulls, placed in two rows (Anthony 2007:325). This presence underscores the importance of the horse at that time. We might also be looking at a funeral feast, where the forty horses may have yielded about 8,000 kg of meat, enough to provide 4,000 individuals with 2kg of horsemeat each. Such a culinary peculiarity is much frowned upon on these shores today, but not so much in other parts of the world, where horsemeat is still considered a delicacy. 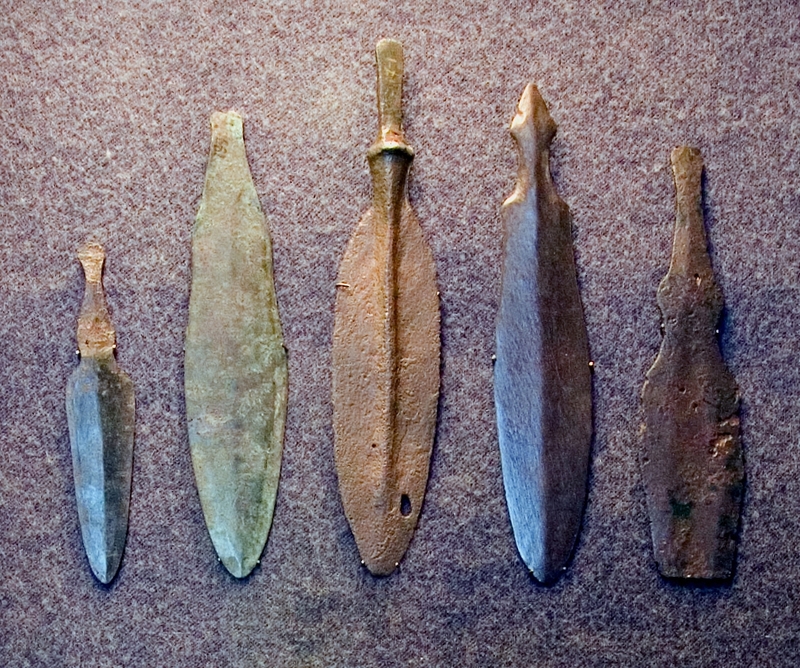 “The Late Bronze Age (LBA) was a period of unprecedented intercultural expansion and trade in the Eurasian steppes. Rich copper deposits in the steppe zone were mined more intensively than before. Ornate bronze weapons and ornaments created by steppe metal smiths were adopted from China to Eastern Europe. Chariots diffused through the steppes to China, the Near East and Europe. 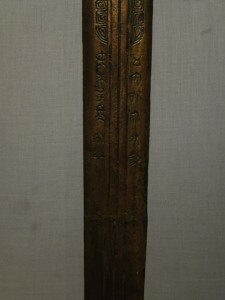 Bronze sword (10th – 8th century BC), engraved with pictograms (seen in detail on the right). There are objects in the exhibit that point to ideas, perhaps even objects reaching Ukrainian territory all the way from the Far East. 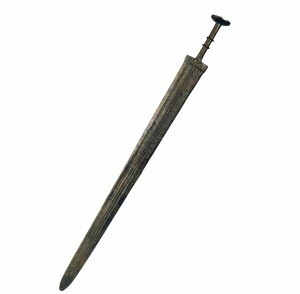 Visitors can see a bronze sword, dating to the 10th to 8th century BC, engraved with pictograms. These are similar to pictogramscreated in Zhou Period China during the eighth to third centuries BC. 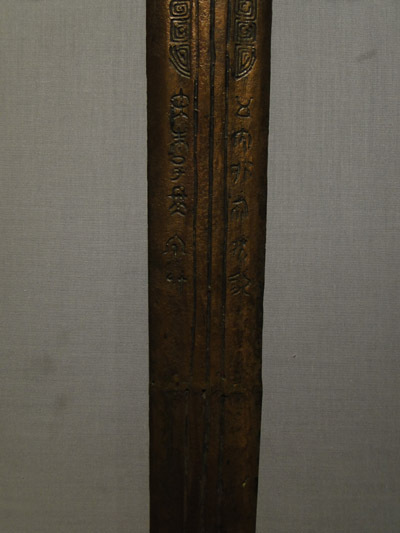 What we might have on display is material evidence of the Silk Road that connected east and west, a series of trade routes that would have taken people through the Tien Shan mountain passes. The knowledge of using pictograms may have taken this route from east to west. One wonders if perhaps the sword itself traveled that route. The Bronze Age in Ukraine was a period of major changes, both in terms of environment, as well as technological breakthroughs. People became more and more connected to a wider world, one that brought new ideas as well as greater dangers. This trend will continue into the Iron Age, a topic for the next blog. Interested in learning more? Make sure to check out our new exhibition Ancient Ukraine, now open. 2007 The Horse, the Wheel and Language. How Bronze-Age Riders from the Eurasian Steppes shaped the Modern World. Princeton University Press, Princeton and Oxford. 2001 Eurasian Steppe Nomad. In Encyclopedia of Prehistory: Europe, Vol. 4. Edited by P.N. Peregrine and M. Ember, pp. 1240138. Human Relations Area File, Inc. Thanks for bringing these fabulous artifacts to our attention!